It has been said that Normandy received of the Vikings, who overran the area the 9th century, a strong moral stamp... characteristics such as: pragmatism, sense of nuance, reserve, prudence and mistrust, the importance of keeping one's word, a sense of order, individualism, craftiness, a taste for concrete materialism, a willingness to take risks and to adventure. 1608: Champlain sets up an "Habitation" at <?<st1:State>Quebec as well as alliances with the Algonquin, Huron and Montagnais tribes for control of the fur trade. 1611: A European colony is established by Champlain on the Island of Montréal (Ville Marie). 1617: Louis Hébert and his family settle at <?<st1:State>Quebec. 1620: Champlain takes on the role of governor of New France. All the time working at getting funding and supplies for the new settlements, and people interested in becoming a part of it all. 1625: Arrival of the Jesuits in <?xml:namespace prefix = st1 />Quebec. 1627: Cardinal Richelieu creates the Company of One Hundred Associates. 1628: In the spring, Robert Giffard of Normandy sails for New France with the first group of about 300 settlers along with supplies for the new settlement. The vessel he is travelling in is intercepted by pirates in the pay of the English. He and the settlers have to return to France. 1632: The Treaty of Saint-Germain-en-Laye enables France to regain possession of Canada. 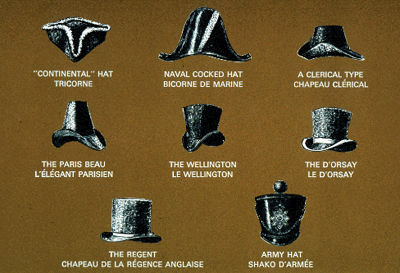 A selection of beaver hats. From the beginning, it was about furs, beaver pelts that were made into hats for those who could afford them in Europe. The demand was there, beavers were plentiful in Canada, and the native people willing to trade their labor and land's resource for metal implements and glass trinkets. Knives and copper pots were popular. Aside from Louis Hébert, the first inhabitants of the settlement of New France were interpreters, clerks and workmen employed by the merchants who arrived yearly to barter for furs. As in all worthy adventures, there were obstacles, such as England and Holland to name a couple, who had their eyes on the same source of wealth, and as for the native people, some of them were downright hostile. Then, there were the French merchants, like ancestor Michel LeNeuf who argued against settlements... who were only interested in the profits of trading. Farmers and Jesuits, they argued, would only complicate the situation. Even so, France determines it would need permanent settlements and trading posts if anything was to be accomplished. Champlain prevailed, and in July 1619, the first 80 passengers which included missionaries, clerks, officers, craftsmen, and laborers arrived in Québec. Ancestor, Louis Hébert and his family were there to greet them. Ancestor, Jean Nicolet was living among the Algonquin on an island in the Ottawa River learning their language and building alliances. But, ordinary French folks seemed not eager to settle in the wilds of Canada. They would arrive one spring and return to France the next. In the year 1625 or so, there were only 7 settled families composed of 20 persons: 7 men, 7 women and 6 children. But, no matter who of the first settlers landed in my family, the pattern is the same... these early adventurers were people of means and all were educated to the standards of the day. Most did not arrive in Canada with the idea to create a new culture or even a new France. They, like the other Europeans: Spanish, Portuguese, English, Dutch, were interested primarily in exploiting the continent. In Canada, however, there was little of value to export other than furs and a long held belief that there would be a shortcut to the orient. What Champlain and other "men of discovery" before him found in North America was primaeval forest and a wilderness barely disturbed by the people living there. This web site makes no attempt at being scholarly, sources and footnotes are often a scramble. The lives of these early ancestors have been researched to the limit; everything known and speculated about them has been published time and again. But, in reading about the actions and circumstances of this handful of people, one can get an idea of what was going on in the French world in the 17th century. To that end, their roles are not insignificant.